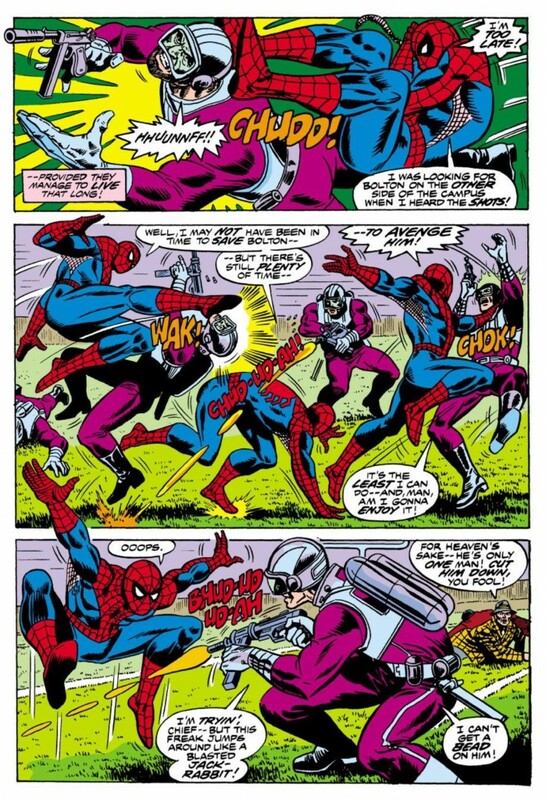 Beyond the fact that I’m a huge fan of this criminally underrated issue of Amazing Spider-Man (I feel like people use the term “underrated” so much that it has the opposite effect and overrates things, but in this instance, I really, really believe that this mid-70’s issue from the front half of the Len Wein/Ross Andru run never gets the love it deserves), I’m really glad Justin made this recommendation as I think the timing couldn’t be better. The title of this one-and-done issue is “The Longest Hundred Yards,” which, for those of you who do not follow athletic competitions more commonly known as “sports,” is a reference to American football (of course, every non-American reading this blog is shaking their heads at the fact that the sport they known as football has been rebranded as “soccer” in the U.S.). I’m a huge fan of sports, primarily baseball, football and basketball in that order. Sports, baseball specifically, were my very first love in life. Before I was buying issues of Amazing Spider-Man off the spinner rack, I was amassing a collection of 1987 Topps baseball cards (with the wood border – such a classic aesthetic). The first time an elementary school teacher asked me what I wanted to be when I grow up, I said Daryl Strawberry (who, at the time, was the most famous player on the New York Mets baseball team before his career/life was upended with drug abuse and other criminal acts). I bet you pegged someone like me as someone who wanted to be Spider-Man or Superman. Nope, I was bitten by the sports bug with much more fervor and juice than the radioactive comic book bug. Part of what I love about sports is I find it to be one of the great equalizers in the world. By that I mean, almost everybody has an opinion about something relating sports, whether it’s a specific sports team (or their rival), a player, or heck, even the fact that somebody explicitly hates a certain sport (or all sports). I have had conversations with totally random strangers just because I was wearing a Brooklyn Nets hat or a Mets jersey. In fact, Chasing Amazing might have never been more than just a personal blog read by my immediate family and friends if not for sports. In the first few months of this site’s existence, I received a link and an endorsement from Comics Should Be Good at Comic Book Resources. And the only reason he had heard about my site is because we were both sports bloggers covering the NBA and a mutual acquaintance (another sports blogger) sent him a link to one of my Spider-Man articles. 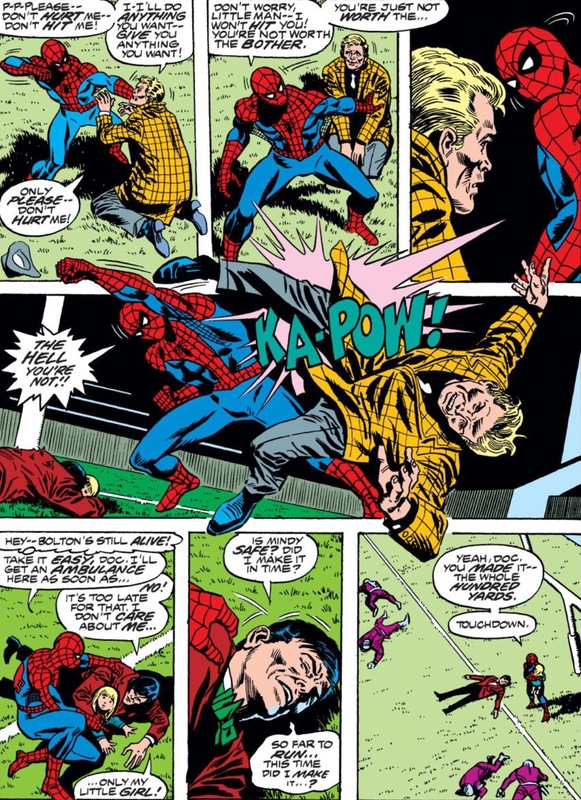 In terms of football – the sport that is highlighted in ASM #153 via Bradley “Boom Boom” Bolton, a former college star who leaves the sport behind to become a very famous “computer wizard” – I know there a number of my Twitter followers who read my tweets on Sunday either complaining or celebrating my Fantasy Football team. And generally, at least somebody in my Twitter feed responds to these tweets because sports is the great equalizer. 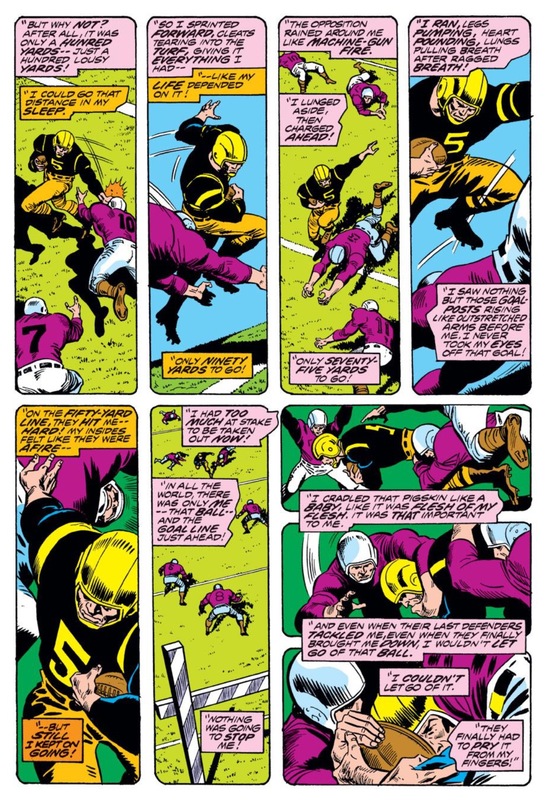 I think it’s important that I keep coming back to the point of sports being an equalizer for any analysis/reaction I write about ASM #153 because Wein’s script uses football as a way to engage the reader with Bolton. To quickly summarize the comic, Ned Leeds is set to write an article about Bolton who is back at Empire State University for the campus’s homecoming celebration. At the beginning of the interview, Bolton talks about the moment that made him give up playing football for good – in the late stages of a game, he attempts to score a touchdown by running 99 yards across the football field. He’s hit multiple times by would-be tacklers, but keeps chugging until he’s eventually dragged down at the one yard line. His teammates were apparently so dispirited by how he fall just short, they fumbled on the very next play and lost the game. During the interview, Bolton receives a letter that makes him visibly distressed. He cuts things short with Ned and takes off in a rush. Peter investigates and discovers that the mob is holding Bolton’s young daughter hostage in exchange for some top-secret technology. When Bolton complies and gives the crooks what they want (the meeting place is the ESU football field), they continue to toy with Boom Boom and claim they’re going to to keep his daughter hostage. 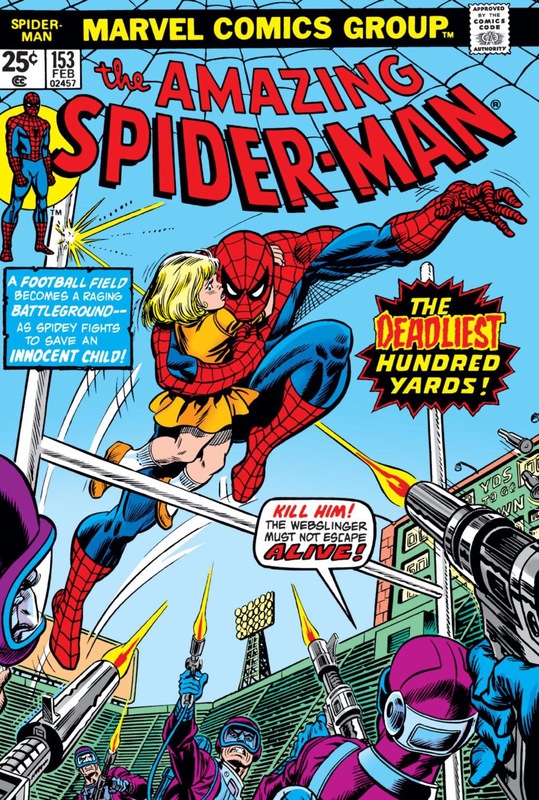 They then order a hit on Bolton, who races across the field, getting grazed by bullets by at every angle, but eventually retrieving his daughter in time for Spider-Man to come and take out the trash. Bolton dies from the gunfire, lying in the end zone (aka, the place he fell short of reaching during his infamous run at ESU), but his daughter is safe. In other words, Bolton made the extra yard this time, but he paid for it with his life. And I believe the reason Bolton’s character seems so rich and surprisingly nuanced (despite only appearing in this one comic) is because of sports. Here’s a guy who was introduced to us as perpetually being at the top of his game, whether it is football or technology. But in reality, his shortcomings of the past continue to haunt and plague him – so much so that in his very final moments alive, he’s wondering if he came up short once again. That’s sports in a nutshell – as the old Wide World of Sports intro used to say, there’s the thrill of victory and the agony of defeat. Oh, how that’s so much like life in general. Sometimes we’re not even aware of our greatest victories in life, but those agonizing defeats have a tendency to stay with us for the rest of our lives. Oh and in actual football an entire outcome can hinge and on a single goal to the point that one player can and does often get blamed for losing the game in one moment. That’s part of the thrill. Doesn’t American football have such key moments? Ultimately without a clue about the game it’s hard to get that excited about the climax because it’s just not clear what the point of the original run is beyond a generic “win the game”. * How is that game “football”? Surely football is a game played with a ball and a foot?